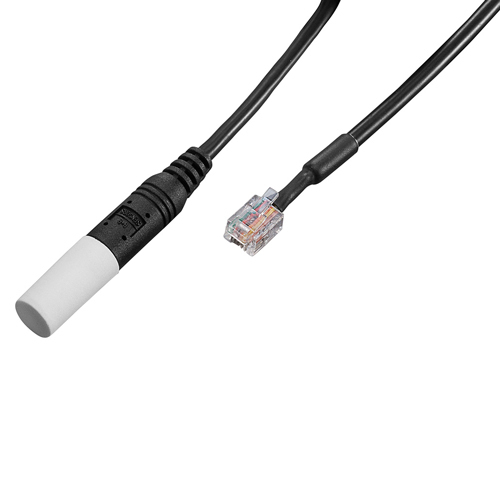 The B+B humidity sensor with RJ12 connector and polyethylen sinterfilter is ideally suited for measuring relative humidity indoors. The sensor element is protected against dust and contaminations with a hydrophobic sinter cap of polyethylene. The electronics integrated in the probe housing linearises the measuring element and improves temperature behaviour. With the universal sensor switching module SENSW-MOD12V, SENSW-GEH230V and the B+B room humidity probe a simple moisture control can be performed. The probe is ideal for the control and regulation of the relative air humidity in green houses, store rooms, terrains or in server-rooms.